JULY 2018 • FOODSERVICE EQUIPMENT & SUPPLIES • 45 W hat's new in college and university foodservice catering? A lot, as it turns out. How about a dining etiquette class? A Death by Chocolate event? A wed- ding reception? A birthday party? Menus keep changing. Students, faculty and visitors alike expect a more sophisticated culinary experience — no more getting away with plated dry chicken and two sides. Sourcing and ingredient transpar- ency, which began and spread quickly in restaurants, also affects campus cater- ing offerings. Chefs and procurement teams, like their residential and retail dining counterparts, face the challenge of sourcing and showcasing local and regional foods. Add to that the need to accommodate students and visitors who have issues with any of the eight major food allergens. Collegiate catering departments respond to new trends and challenges with creativity and perseverance. A number of directors and managers point to a sea change that transforms catering departments from offering traditional, run-of-the-mill support services to delivering dynamic, crowd- pleasing culinary events. One illustrative example: The University of Notre Dame celebrated its new sports stadium last fall. Invited guests who toured the new facility got a delicious surprise when they reached three stadium boxes on the ninth floor. "In the first box, we had a truffle-mak- ing session going on," explains Sunil Yaradi, director of university catering. "We had truffles displayed like it was a chocolate shop. Chefs would create truffles to order. In another box, our pastry chef created chocolate artwork. In the third box, we had a variety of finished chocolate desserts. We paired them with pink rosé champagne." Yaradi sees the uniqueness of this event as a trend. "We have evolved," he says of campus catering in general. "Guests might have the usual breakfast, lunch and dinner, but they want to end with a really special event." Another example of catering departments spreading their wings to provide services well beyond traditional banquets: At Yale University, catering helps ensure its graduates are savvy about dining etiquette in the outside world by the time they leave campus. The residential dining department sponsors one program, Reality Bites, that the catering arm executes. Classes include training in such skills as how to behave in a restaurant during a business meeting and even how to cook at home. 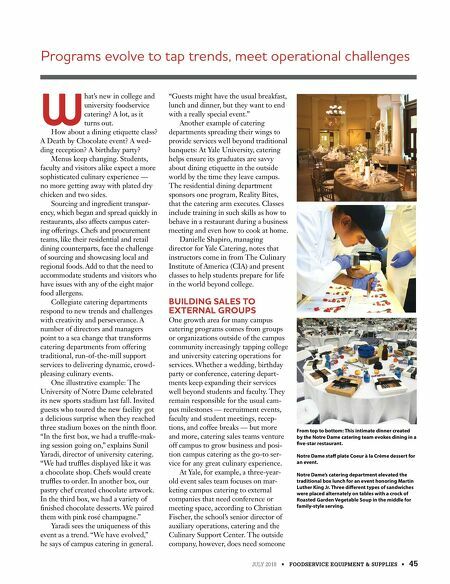 Danielle Shapiro, managing director for Yale Catering, notes that instructors come in from The Culinary Institute of America (CIA) and present classes to help students prepare for life in the world beyond college. 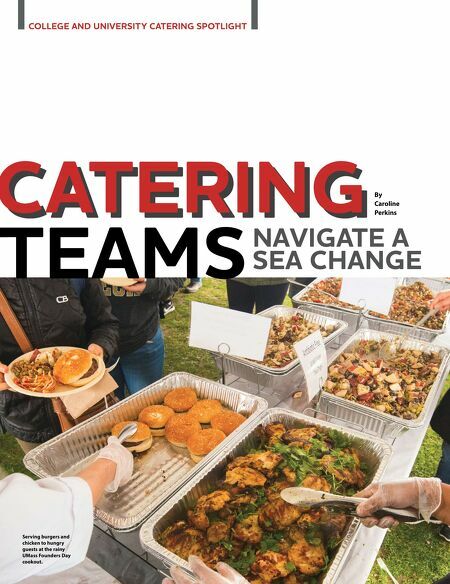 BUILDING SALES TO EXTERNAL GROUPS One growth area for many campus catering programs comes from groups or organizations outside of the campus community increasingly tapping college and university catering operations for services. Whether a wedding, birthday party or conference, catering depart- ments keep expanding their services well beyond students and faculty. They remain responsible for the usual cam- pus milestones — recruitment events, faculty and student meetings, recep- tions, and coffee breaks — but more and more, catering sales teams venture off campus to grow business and posi- tion campus catering as the go-to ser- vice for any great culinary experience. At Yale, for example, a three-year- old event sales team focuses on mar- keting campus catering to external companies that need conference or meeting space, according to Christian Fischer, the school's senior director of auxiliary operations, catering and the Culinary Support Center. The outside company, however, does need someone Programs evolve to tap trends, meet operational challenges From top to bottom: This intimate dinner created by the Notre Dame catering team evokes dining in a five-star restaurant. Notre Dame staff plate Coeur à la Crème dessert for an event. Notre Dame's catering department elevated the traditional box lunch for an event honoring Martin Luther King Jr. Three different types of sandwiches were placed alternately on tables with a crock of Roasted Garden Vegetable Soup in the middle for family-style serving.